Zionism Unveiled: Who are the Chabad Lubavitchers? We can argue about who is most to blame, but the facts remain the same: Congress and the White House have been helping to establish a theocracy in America. That's right, in America -- the nation that used to be a land of religious freedom. •Want to force US citizens to embrace a synthesized "religion" invented for a servant class. The would-be theocratic leaders that Congress and our presidents have been promoting are members of a sect called Chabad Lubavitch, headquartered in Brooklyn, New York. Chabad, (sometimes spelled "Habad"), is an acronym for three Hebrew words: Chochma, Binah and Daas, which mean "wisdom, understanding and knowledge." Chabad and Lubavitch are functionally synonymous. Chabad describes the movement; Lubavitch is the name of the town (sometimes said to be in Lithuania, sometimes in Russia) where the movement was headquartered during the nineteenth century. 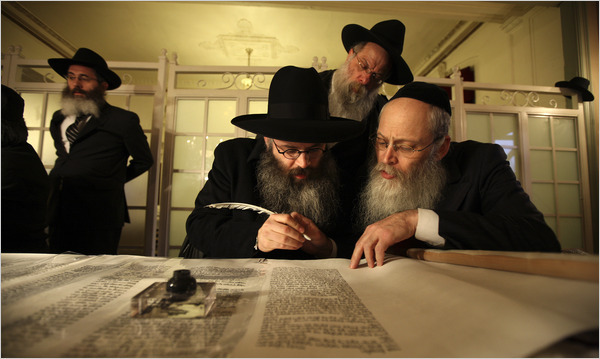 The Chabad Lubavitchers also rely on the works of renowned Jewish teachers such as Maimonides. Of course they rely on the Torah; but note that the word "Torah," in Jewish religious discourse, is somewhat elastic; it can denote (1) the Pentateuch (the first five books of the Old Testament), (2) the Old Testament in its entirety, (3) the Old Testament in its entirety, and the Talmud, and (4) the entire body of Jewish religious literature. Reviewing the above, we can see that, doctrinally, Lubavitchers are not an aberration within Judaism. They are as much part of Judaism as the Dominicans are part of the Roman Catholic Church. It would be misleading to call the Lubavitch movement a "cult" as some have done, without so naming mainstream Orthodox Judaism. Some Lubavitchers consider the Reeb their Messiah and await for him to return from the dead; other say that the Messiah is really the Jewish people themselves. If all that is beginning to sound weird and fringy, realize that the Lubavitchers do not confine themselves to Brooklyn, New York. They have immediate and constant access to the President of the United States: George Bush's Press Secretary, Ari Fleischer, a Reform Jew, works the Lubavitcher mission. The most prominent backer of the Lubavitchers on Capitol Hill is Senator Joseph Lieberman (D.Conn. ), an Orthodox Jew, and the former candidate for the Vice-Presidency of the United States. The chairman of the Senate Armed Services Committee, Sen. Carl Levin (D-Mich.), has commended Chabad Lubavitch "ideals" in a Senate floor statement. Jewish members of Congress regularly attend seminars conducted by a Washington DC Lubavitcher rabbi. The Assistant Secretary of Defense, Paul D. Wolfowitz, the Comptroller of the US Department of Defense, Dov Zakheim (an ordained Orthodox rabbi), and Stuart Eizenstat, former Deputy Treasury Secretary, are all Lubavitcher groupies. According to the Jerusalem Post of October 19, 2001, "Chabad is a potent force: 2,600institutions around the world, large numbers of English-speaking rabbis, control of most of Judaism in Italy as well as the chief rabbinate of Russia (its Russia budget alone is $20 million a year). It is an organization with immense world-wide financial resources . . . In fact, Chabad is a movement of monumental importance. Observant Jews are profoundly dependent on its emissaries all over the world . . . its rabbis dominate or are poised to dominate Jewish communities in a startling number of countries." The Jewish Virtual Library tells a similar story: "More than 3,700 emissary couples work in more than 100 countries worldwide. Since 1995, more than 400 shlichim (emissaries) were assigned to new posts and more than 500 new Chabad institution [sic] have been established, bringing the total to nearly 2,600 institutions (seminaries, day camps, schools, etc) worldwide. According to headquarters, almost one million children participates [sic] in Chabad activities worldwide in 1999." The Lubavitchers are proselytizers, but of a different sort. They want to make all Jews -- Reform, Conservative or Orthodox --hyper "Jewish." Thus we see Orthodox Jews like Lieberman and Reform Jews like Fleischer standing side-by-side working the Lubavitcher program. Lubavitchers don't want to convert non-Jews to Judaism -- they want Jews to understand they are a class apart from everyone else. In a letter he wrote in 1964, Schneerson deplored intermarriage of Jews with non-Jews, calling it "spiritual cremation," and called the concepts of freedom, equality, and integration "misconceived ideals." This is particularly amusing, inasmuch as in the Jews led the movement to forcibly integrate the South which resulted in the 1964 Civil Rights Act. (Editor's Note: The Jews hijacked the Black Civil Rights Movement to suit their own ends. This is thoroughly documented fact.) The Religious Action Center for Reform Judaism tells us that "During the Mississippi Summer of 1964, Jews made up half of the young people who volunteered in the effort to end segregation." Obviously, integration and mixed marriages are for the Gentiles, not the Jews. Editor's Note: So why in the world are we honoring a man who is supposed to be an image of diversity and tolernace?